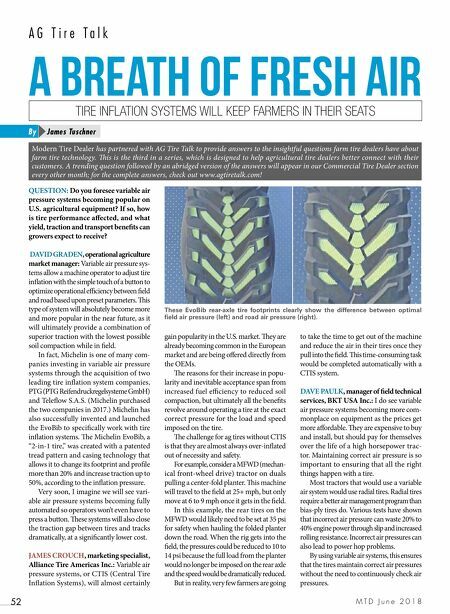 M T D J u n e 2 0 1 8 52 A G T i r e T a l k QUESTION: Do you foresee variable air pressure systems becoming popular on U.S. agricultural equipment? If so, how is tire performance affected, and what yield, traction and transport benefits can growers expect to receive? DAVID GRADEN , operational agriculture market manager: Variable air pressure sys- tems allow a machine operator to adjust tire inflation with the simple touch of a button to optimize operational efficiency between field and road based upon preset parameters. is type of system will absolutely become more and more popular in the near future, as it will ultimately provide a combination of superior traction with the lowest possible soil compaction while in field. 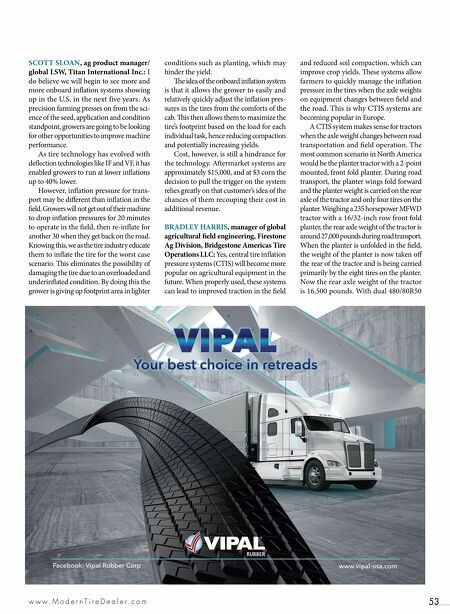 In fact, Michelin is one of many com- panies investing in variable air pressure systems through the acquisition of two leading tire inflation system companies, PTG (PTG Reifendruckregelsysteme GmbH) and Teleflow S.A.S. (Michelin purchased the two companies in 2017.) Michelin has also successfully invented and launched the EvoBib to specifically work with tire inflation systems. e Michelin EvoBib, a "2-in-1 tire," was created with a patented tread pattern and casing technology that allows it to change its footprint and profile more than 20% and increase traction up to 50%, according to the inflation pressure. Very soon, I imagine we will see vari- able air pressure systems becoming fully automated so operators won't even have to press a button. ese systems will also close the traction gap between tires and tracks dramatically, at a significantly lower cost. JAMES CROUCH , marketing specialist, Alliance Tire Americas Inc.: Variable air pressure systems, or CTIS (Central Tire Inflation Systems), will almost certainly gain popularity in the U.S. market. ey are already becoming common in the European market and are being offered directly from the OEMs. e reasons for their increase in popu- larity and inevitable acceptance span from increased fuel efficiency to reduced soil compaction, but ultimately all the benefits revolve around operating a tire at the exact correct pressure for the load and speed imposed on the tire. e challenge for ag tires without CTIS is that they are almost always over-inflated out of necessity and safety. For example, consider a MFWD (mechan- ical front-wheel drive) tractor on duals pulling a center-fold planter. is machine will travel to the field at 25+ mph, but only move at 6 to 9 mph once it gets in the field. In this example, the rear tires on the MFWD would likely need to be set at 35 psi for safety when hauling the folded planter down the road. When the rig gets into the field, the pressures could be reduced to 10 to 14 psi because the full load from the planter would no longer be imposed on the rear axle and the speed would be dramatically reduced. But in reality, very few farmers are going to take the time to get out of the machine and reduce the air in their tires once they pull into the field. is time-consuming task would be completed automatically with a CTIS system. DAVE PAULK , manager of field technical services, BKT USA Inc.: I do see variable air pressure systems becoming more com- monplace on equipment as the prices get more affordable. ey are expensive to buy and install, but should pay for themselves over the life of a high horsepower trac- tor. Maintaining correct air pressure is so important to ensuring that all the right things happen with a tire. Most tractors that would use a variable air system would use radial tires. Radial tires require a better air management program than bias-ply tires do. Various tests have shown that incorrect air pressure can waste 20% to 40% engine power through slip and increased rolling resistance. Incorrect air pressures can also lead to power hop problems. By using variable air systems, this ensures that the tires maintain correct air pressures without the need to continuously check air pressures. A breath of fresh air James Tuschner By Modern Tire Dealer has partnered with AG Tire Talk to provide answers to the insightful questions farm tire dealers have about farm tire technology. is is the third in a series, which is designed to help agricultural tire dealers better connect with their customers. A trending question followed by an abridged version of the answers will appear in our Commercial Tire Dealer section every other month; for the complete answers, check out www.agtiretalk.com! TIRE INFLATION SYSTEMS WILL KEEP FARMERS IN THEIR SEATS These EvoBib rear-axle tire footprints clearly show the difference between optimal field air pressure (left) and road air pressure (right).